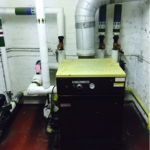 St Johns Church in Glossop underwent a major heating system renovation, including new boiler installation and excavation work. Such to the extent was this church heating system installation that our engineers had to dig up parts of the grounds, but the grass is now greener in more ways than one. A proposal for a new heating system installation had been compiled by another company, but they were not happy with it, and so came to us for a second opinion. It turned out that the original proposal needed to be scrapped, and our engineers started from scratch, putting together a more concise and complete statement of works, as well has heat loss reports and a site survey. 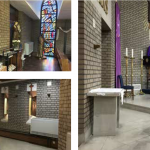 This new proposal was approved by the Diocese, and work began straight away. Everything from the radiators to the flue had to be ripped out, along with all the bits in-between. 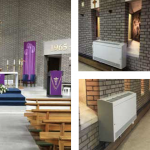 Most of the major components of the heating system were too far gone to salvage, but as much as possible was re-used in order to save the church money. As well as the usual boiler, radiator and piping replacement, it was also necessary to install a new mains gas feed, which involved digging up parts of the grounds. Our workers were very conscious as to preserve as much as the grass and flowers as possible, as to not have too much of an impact of the aesthetics of the surrounding grounds. To find out more about this project and see more pictures, click here.